This professionally recorded CD features all of the works in the J. S. Bach 18 Short Preludes, Alfred publication #601, and is sure to inspire artistic performances. Collected from several sources, these teaching pieces were published separately in the 18th and 19th centuries as the Twelve Short Preludes and the Six Short Preludes. Students are often introduced to these works prior to studying the Two-Part Inventions (Alfred Edition 22528). 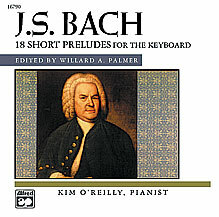 This unique edition includes the realization of ornaments and guidance concerning tempos and articulation. Pianist Kim O’Reilly Newman holds a Master of Music degree from the University of Illinois. She has performed throughout North America and Europe with the Hambro Quartet of Pianos and was an editor and recording pianist for Alfred Publishing. Kim is a brain tumor survivor and now specializes in performing music for the left hand. Piano Music, CD, Piano Collection, Masterwork Edition, Classical Music – This professionally recorded CD features all of the works in the J. S. Bach 18 Short Preludes, Alfred publication #601, and is sure to inspire artistic performances. Collected from several sources, these teaching pieces were published separately in the 18th and 19th centuries as the Twelve Short Preludes and the Six Short Preludes. Students are often introduced to these works prior to studying the Two-Part Inventions (Alfred Edition 22528). 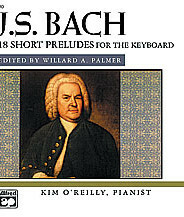 This unique edition includes the realization of ornaments and guidance concerning tempos and articulation. Pianist Kim O’Reilly Newman holds a Master of Music degree from the University of Illinois. She has performed throughout North America and Europe with the Hambro Quartet of Pianos and was an editor and recording pianist for Alfred Publishing. Kim is a brain tumor survivor and now specializes in performing music for the left hand.